If you’re choosing a web application security scanner for the first time, or struggling to get the most out of Detectify, here is why you should consider Acunetix instead. You know the importance of web security testing: according to the most recent Verizon Data Breach Investigation Report (DBIR), more data breaches begin with a web application attack than in any other way. 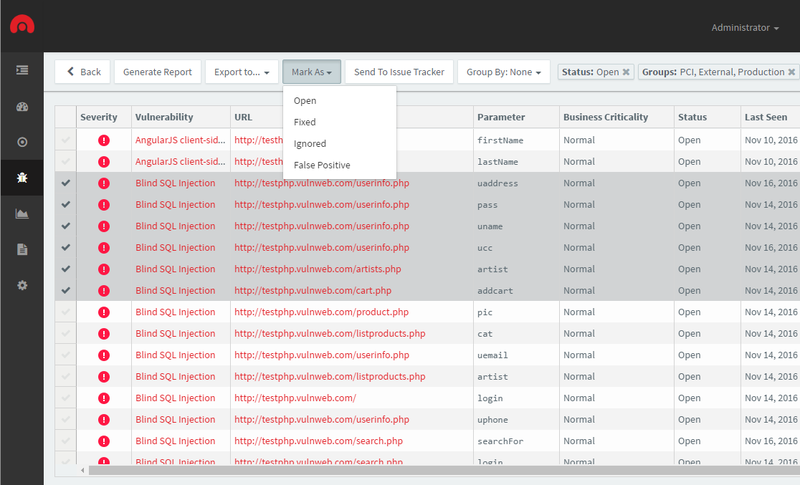 You need a full-featured web application scanning solution that quickly and accurately identifies OWASP Top 10 vulnerabilities like SQL Injection, cross-site scripting (XSS), and other high-severity security vulnerabilities, reports them in a way that allows your team to understand your security status, and scales as your business grows and changes. Businesses are depending on custom-built web applications more than ever. As more tasks for both employees and clients shift to the web, you need a scanner that can test quickly for security vulnerabilities and give you the most reliable results. Acunetix offers options for both on-premises and Software-as-a-Service vulnerability scanning. Depending on your current and future capacity needs, we have a version that will work for you and your business. No matter which option you choose, you get our lightning-fast scan engine: the result of over a decade of research, development, and tuning. Version 12 of Acunetix features our fastest scanning engine yet, so you can identify a full range of software vulnerabilities with industry-leading speed, and move more quickly from scan results to a secure web presence. No matter what platforms your business depends on, now or in the future, you can trust Acunetix to identify website vulnerabilities. Whether your business depends on open source content management systems like WordPress or custom-built applications, Acunetix will understand the structure and identify critical security issues in the OWASP Top 10 and beyond. Whatever your application stack, Acunetix will crawl through the entire application, identify the security vulnerabilities, and report on them in a way that allows you to easily understand what you need to remediate. Acunetix is the only scanner on the market with AcuMonitor. Web application security scanners typically depend on request/response testing: the scanner sends a request, analyzes the response, and identifies whether a vulnerability exists. This makes sense for issues that are triggered immediately, but falls short for issues such as XML External Entities (XXE), Blind XSS, and Server-Side Request Forgery (SSRF). These issues can only be detected later, when the attacker-controlled code is accessed, often by a different user on a different browser, who is accessing a web application that depends on the same data. AcuMonitor gives you the power to detect these vulnerabilities: when the scanner’s payload runs, it calls back to Acunetix, and the scanner lets you know that the vulnerability exists in the web application. AcuMonitor helps you identify these vulnerabilities that other scanners miss. Unlike Detectify, Acunetix also gives you the power of AcuSensor — its exclusive web server sensor. If your business depends on open source or custom applications written in Java, ASP.NET, or PHP, AcuSensor can give you code-level insight. This pinpoint accuracy not only makes scans even more fast and accurate, but for businesses who have their own in-house development teams, it makes identifying and remediating the vulnerable source code even easier.